Visiting Aldeburgh these days is rather like visiting the shrine of St Bernadette at Lourdes. Hopefully I do not need to restate my admiration for Britten the composer. But his elevation to sainthood is rather ridiculous and does contribute to the neglect of other less heavenly but nevertheless first-rate composers. Among them is Sir Malcolm Arnold, whose mortal sins - which included indulging in a dram or three and writing an Oscar-winning movie score - are more than offset by nine persuasive symphonies which share with Britten the influence of Mahler and Shostakovich. The impact of visionary composers such as Mahler, Shostakovich and Britten on music history is much discussed. But the influence of impresarios such as Walter Legge, William Glock and Britten – this time in his role as founder of the Aldeburgh Festival – receives little attention. There is little doubt that dumbing-sideways – impresarios exercising personal musical preference – did more good than harm when practised by visionaries such as Legge, Glock and Britten. But when, as is the case today, the power to dumb-sideways - or up or down - is in the hands of less visionary corporate moguls we should be concerned. 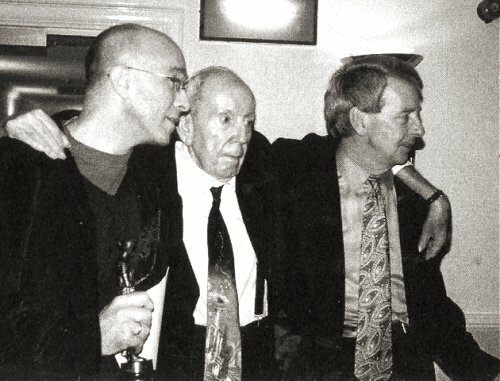 My header photo shows the irrepressible Sir Malcolm with his biographer Paul Jackson (foreground) and carer Anthony Day. Malcolm Arnold's Second String Quartet was given its first performance at the 1976 Aldeburgh Festival months before Britten died. But in The Life and Music of Sir Malcolm Arnold Paul Jackson illustrates how the subtle art of dumbing-sideways works. Arnold moved [publisher in 1965] to the newly formed Faber Music, set up to publish the music of Benjamin Britten, who had decided to leave Boosey & Hawkes after nearly twenty-five years with them. Donald Mitchell, who had been one of Arnold’s main critical supporters in the early days, directed the new publishing venture. To him, Arnold seemed a natural choice and ‘a great acquisition for Faber’. Britten was ‘delighted’ when he heard that Arnold had joined the list, but although he received copies of all Arnold’s scores that Faber published , the works were seldom performed at Aldeburgh. Photo credit is The Life and Music of Sir Malcolm Arnold by Paul Jackson. Any copyrighted material on these pages is included as "fair use", for the purpose of study, review or critical analysis only, and will be removed at the request of copyright owner(s). Also on Facebook and Twitter. I really fail to see the value of your newly coined expression 'dumbing sideways'. The expression 'dumbing down', although almost as abused as 'politically correct', at least means something. 'Dumbing' is the reduction of intellectual or challenging content and 'down' points to the audience you are aiming at i.e. your supposedly less sophisticated inferiors. So what can 'dumbing sideways' possibly mean? Reducing intellectual content in order to appeal to an audience you consider your equal? I simply devised 'dumbing-sideways' to be an extension of the widely accepted concepts of dumbing-down and dumbing-up. Any other suggestion for a catchy expression for 'impresarios exercising personal musical preference' that fits into a single line headline and grabs attention in our Twitter-centric times?